Question: What do you get when you combine a mortician with high-level security access, a presumed dead military artist, and Harry Houdini? 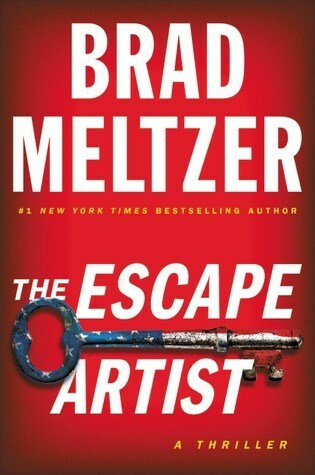 Answer: Brad Meltzer's new novel "The Escape Artist." Many top-shelf, best-selling authors have weighed in, giving The Escape Artist high marks. I noticed they seemed to concentrate on Nola as the star. While it is obvious Nola will be the central character of this new series, In my opinion, Zig stold her thunder this time. Don't get me wrong, I found Nola interesting if somewhat cookie-cutter predictable. I can definitely see her shedding the GI Jane facade and letting readers get to know her in future novels. Zig is a military mortician. He is stationed at a top-secret base, with high-level security clearance and takes his responsibility to the fallen and to their family very seriously. He works a special kind of mortician's magic to reconstruct, rebuild and hide horrific, catastrophic wounds. He knows, all too well how difficult it is when you lose a loved one to find any matter of closure. It is this personal loss, the nagging grief that Zig is carrying that makes him a relatable, every-day kind-of-character. When a plane crashes shortly after taking off from a top-secret base and one of the dead has been triple check identified wrongly, Zig knows something much, much bigger is at stake. He knows Nola. Years ago she saved Zig's daughter from certain death during a fire at Girl Scout Camp. Nola sustained scars that day and the body infront of him did not have those scars. He knows two things for certain, Nola is not dead and a lot of higher-ups are going great lengths to convince the world that she is. The question is - why? What follows is a fast paced, all Meltzer all the way style novel. In addition to penning best sellers, Brad Meltzer is known for chasing historical stories and finding lost treasures. His ability to weave a nod to some long-ago story into an action-packed, suspense-thriller is unparalleled. You will not find another book on the shelf quite like this one. The Escape Artist holds your attention, keeps you turning the pages and is one heck of an introduction to a new series. If you're looking for a realistic, docu-drama type read, this isn't for you. But if you are looking for a book that will entertain you for a few hours and leave you wanting to go further with the characters - you will enjoy The Escape Artist. **Thank you to Grand Central Publishing and NetGalley for the opportunity to read, review and share this book. Nola is supposed to be dead.